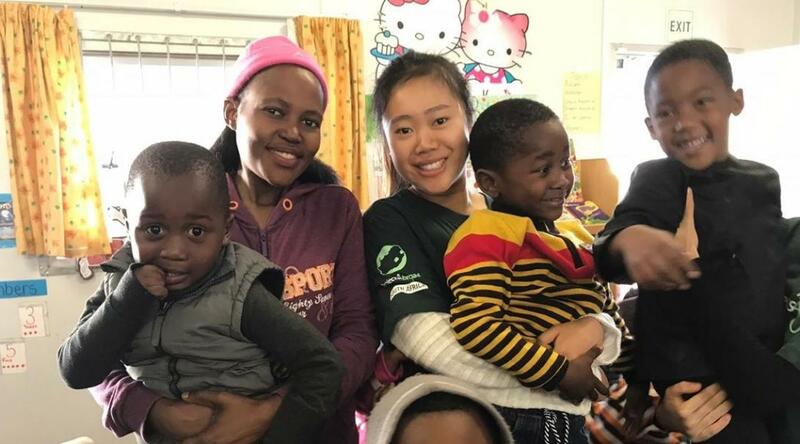 My name is Jenny Guo and I spent two weeks of July 2017 doing volunteer work on the Care and Community placement in South Africa. I am 16 years old and both me and my friend, Sharon decided to do this project together in summer as something meaningful and fun. If I was to describe the two weeks I spent in Cape Town in one word, it would be unforgettable. Prior to departure, my parents were rather nervous about my trip due to safety issues, but they can be assured that not once did I find myself in any trouble. If you follow the rules and don’t do anything silly, then you should be safe. After a long coach journey and two plane journeys, I finally arrived in Cape Town feeling apprehensive but excited at the same time. I was met by a member of the Projects Abroad staff and after waiting for everyone to arrive, we were driven to our host families. On arrival at my host mum’s house, I was instantly welcomed with open arms and greeted by all the other lovely volunteers. The other volunteers came from all over the world: Italy, France, England, Ireland, Belgium, Denmark, America and Nigeria. Having such a multicultural family made the experience extremely fun and interesting, as we shared things about our own cultures and taught each other different languages. Through numerous card games, cups of tea and music jamming sessions, we all became such a close, friendly family. Everyone was so kind. Talking about kindness, I can honestly say Faye, my host mum, is the best host mum anyone can have; her stories, warmth, friendliness and love is something I will never forget. She truly made me feel like a member of her family and her irresistible, delicious cooking left me a few pounds heavier after the trip. Faye provided breakfast, lunch and dinner. For breakfast she did a buffet style of eggs, bread, salad, yoghurt, milk, cereal and meat. Lunch included packing our own sandwiches for our work placements and dinner varied every day; spaghetti, chicken, vegetables, rice. One thing I can assure you is we were never left hungry! There was always lots of food on the table and at times, we ate out at restaurants too. I shared a bedroom with Sharon and we were provided with a desk, shelves, hangers and comfortable bedding. During my visit, there was a water crisis in South Africa which meant showers were limited to three minutes. Since there were many volunteers, sometimes we had to wait to use the toilets and bathrooms, but I got used to it very quickly and it wasn’t a big problem. Also, Wi-Fi and washing of clothing was provided for a small fee. For the Care and Community Project, I was based at the Tehilah Educare Centre, where I met the sweetest and most grateful children ever. There were approximately 90 children in total and volunteers were designated a specific class group. I chose a class of four to five year olds. Despite not having the best resources and environment, the way the children were so appreciative of everything was truly amazing. When I arrived, it was actually the school holiday programme for the children, so officially it was their winter holiday and thus the routine was different to their usual teaching routine. My working day would start at around 9:00am and end at 2:30pm and the daily routine involved taking them to play in the park, toilet routine, handing out lunch boxes, reading stories, helping with their naptime and teaching the basics of literacy. The children would always call me ‘Teacher, Teacher’ and they would want to play with my hair, which at first I found slightly strange, but soon I adjusted to it. It was impossible not to fall in love with the smiles of the children. The teachers were all so friendly and assisted me with anything I needed. For future volunteers, I would recommend planning some activities, games, and teaching exercises before going to your placement, as it makes working with the children easier. I would say the two most memorable events were working at Where Rainbows Meet to cook food for more than 200 people and renovating a local school. It felt amazing to be able to give back to the local community by providing them with a meal. It was nice to know that, at least for today, they were able to get one meal, and to see their smiles was truly the best. In addition, being able to renovate a school by painting the walls was really fun, as we were able to transform it into a livelier environment for the children to learn in. Knowing that our work would be there for a long time felt great. Aside from these events, I would say Faye and the other volunteers truly made my experience memorable through the endless jokes, laughter and love! During the evenings, there were numerous social events that were included in the itinerary, providing a chance for me to meet other volunteers and socialise. We visited markets, went to Rush trampoline park, had a barbeque at Faye’s house, visited Robben Island, spent time at Boulders Beach (there are lots of penguins! ), visited the Cape of Good Hope and, my favourite, visited Table Mountain. Being able to take in the beautiful views of Cape Town at the very top of Table Mountain truly was a unique experience. At times it was difficult travelling in a large group, as I found myself waiting quite a bit for others, but soon I adapted to it and ended up taking mini naps when waiting. The people in Cape Town are very lovely and generally they have quite a laid back attitude, but if at times you feel some people appear hostile, particularly in local townships, it’s important to remember that they don’t interact with foreigners often. By embracing the culture, talking to people and listening to their stories, it will make your experience more fun and you can gain such a great insight into the lives of the local people and their history. It was upsetting to hear their struggles during Apartheid, but it encouraged me to work hard to bring about change in the lives of local people, no matter how small. Even today, there is stark inequality between the poorest and richest communities and there are high unemployment rates, which is surprising since Cape Town is known as a relatively wealthy city. In conclusion, I don’t believe words can truly describe the unforgettable experience I had. From the people, cultures and trips, the memories I gained will forever remain with me. Not once did I feel unwelcome and Projects Abroad worked very hard to make sure everyone felt safe and happy. If you have any problems, you’re only a phone call or email away from having someone on hand to advise you. I cannot recommend the experience enough, whether you do two weeks, four weeks or five months, you will leave with memories and knowledge that will remain with you forever. I want to thank Projects Abroad for providing me with this unique opportunity and I can’t wait to return to Cape Town in the future. So if you’re considering whether to go and volunteer, I have one word for you: Go! This review may include references to working in or with orphanages. Find out more about Projects Abroad's current approach to volunteering in orphanages and our focus on community-based care for children.